It says the rails use drill rod. Does that mean they have a thread? If yes, what for? Or is my understanding of English wrong, and a drill rod is a rod with a smooth surface? About the linear rails and ball bearings it says that the bearings are side loaded. Is that an engineering term which expresses that the bearings are fully on the rails, but a bit sideways? Is this design due to the fact that the slide can only move along one axis? 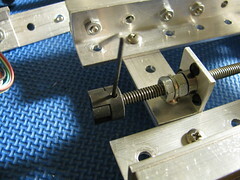 The current design of shaft mounts uses screws to put the bearing in place. Why did'nt you simply drill a bigger hole in the angle and press the bearing inside? 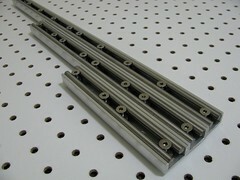 Drill rod is a smooth hardened rod. I think drills bits are (were) made from it. 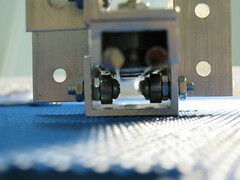 The ball bearings in this design are loaded both radially and axially (up-down and sideways, looking at the picture). Small axial load is not a big problem, but in this case it is also applied at a single point, not distributed evenly as in, for example, the shaft mount (pic on the right). This results in ball bearing wear. On the shaft mount question: I think the load applied by e.g. leadscrew drive could pull out the bearing out of such a hole. You'd probably have to drill a shallow partial hole to hold the bearing in place, and it would be hard to get it level without a drill press. Also, 1/2" drill bits are sort of special and may not fit into all drills, while 3/8" is usually the biggest size in a typical drill bit set. 1/2" countersink bit can be used, but it produces a conical surface which would again make it difficult to keep bearing level.